Your browser doesn't support the technology used on this page. For a better (and more secure) web experience, try using Chrome or Firefox. Hundreds of millions of dollars were donated and appropriated to help people, business and towns recover from Tropical Storm Irene. 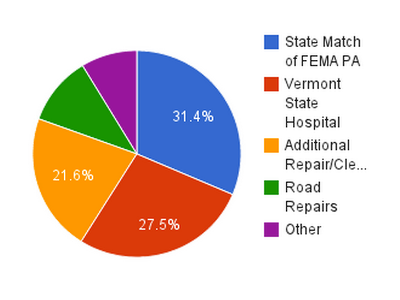 In this first installment of the Mapping the Money project, we take a look at FEMA, which has spent far more on relief and recovery than any other group; a total of more than $260 million so far. Individuals and Households Program (IHP) provides money and services to people in Presidentailly declared disaster areas. IHP is comprised of Housing Assistance (HA) and Other Needs (ON). Provides assistance for disaster-related housing needs. Provides assistance for other disaster-related needs, such as furnishings, transportation, and medical. Public Assitance (PA) is available for communities to quickly respond to and recover from major disasters or emergencies declared by the President. The Hazard Mitigation Grant Program (HMGP) provides grants to states and local governments to implement long-term hazard mitigation measures after a major disaster declaration. The purpose of the HMGP is to reduce the loss of life and property due to natural disasters and to enable mitigation measures to be implemented during the immediate recovery from a disaster. The above graph represents the federal relief dollars that went straight to Vermont State Government organizations and relief efforts via the Public Assistance Program. The supplemental dollars are not included in the above graph. The data represented is accurate as of June 13, 2013 as reported to VPR. Values will change as more funding is approved. Data from villages was rolled up into the towns that the villages are located within.